Facebook just announced a new feature that’s being marketed as “a new way to share,” but it’s ominous at best. Imagine: you’re in a cafe and a song comes on that you don’t even know or like – Facebook can recognize that song and it will help you create a new status update using that information. Unlike most other features the social network has introduced, the app update is not a default feature. 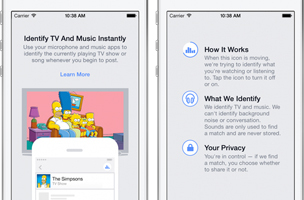 Users must turn it on in order to publicly share whatever music or movie they might be experiencing. It’s like turning your smartphone into a sound bot that will help you socially broadcast your auditory life to all of your friends and acquaintances. Start typing in an update and it will prompt you to tell everyone you’re jamming to Taylor Swift. The only gimmick to using the new status updates will be its 30 seconds of audio samples that accompany your status. Otherwise, it’s not better than setting up Spotify or Soundcloud to send your real music habits to your social feed. Clearly, the technical capability of audio sampling and matching can be used to locate you and other smartphone users. Let’s say you are at a concert with a handful of other music lovers – sound recordings from the concert can actually place you at that location based on audio samples. It’s only a matter of having the wrong app or the wrong smartphone settings for your phone to automatically detect your location, even if you never turn on GPS tracking.